You’re the kind who likes a little longevity in your heroes. Even the longest-tenured and best-known comic book superheroes have only been on the scene for what, 70 or 80 years? While that’s a long time to combat crime by any measure, it doesn’t hold a candle to Zorro. That guy’s been fighting the good fight since his first book dropped, way back in 1919. In an era when hot new heroes rocket to the top and are forgotten before the next blockbuster hits, Zorro is closing in on a solid century of taking from the rich and giving to the poor, and his trademark black mask and “Z” signature are just as recognizable as ever. That’s your type of hero, the kind you can set your watch by. Superheroes may come and go, but as long as there are swashes in need of buckling, Zorro is going to be there. 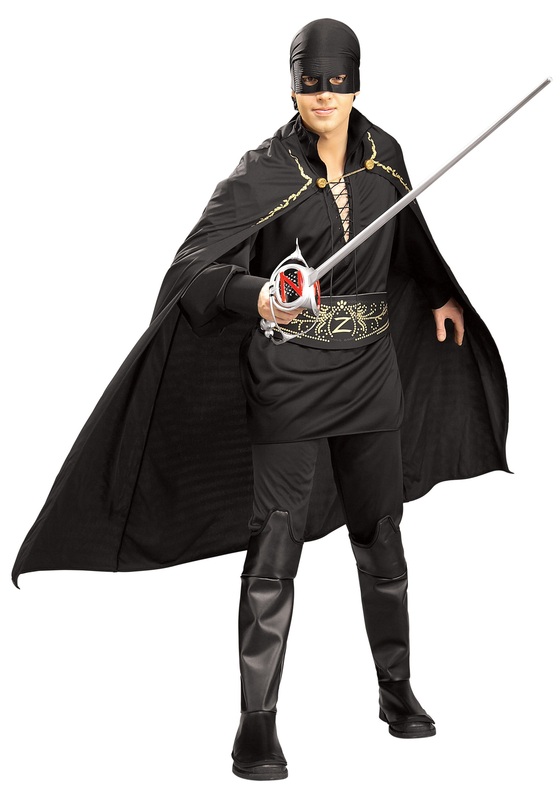 Pay tribute to the staying power of the original mysterious masked man with this dashing black polyester ensemble, featuring a long-sleeved shirt with lace-up front, matching pants with faux-leather boot tops, a flowing black cape with gold leaf accents, a black foam belt emblazoned with the classic “Z” logo, and of course the all-important black foam mask with attached bandana. It’s a look that’s served Zorro well for nearly 100 years, and it’s just as dashing today as it was back in 1919.